By Mark Hoyer, editor of Cycle World. It’s awesome when a bike just comes together, when every part of your project seems like it was made to fall into place as if by some grand, cosmic plan. This is not one of those bikes. No, “The Punisher” (named after the Marvel Comics anti-hero) earned its title by brutalizing the man who commissioned it, Bruce Baxter, and all those involved in the making of this big-block beast. 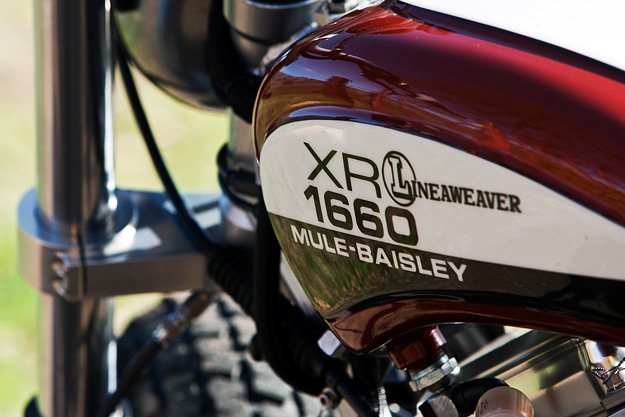 Mule Motorcycles’ Richard Pollock—the builder who somehow brought together and massaged all the special parts into the stunning package you see here—wholeheartedly agrees that this XR1660 street-tracker lived up to its namesake. But, as you can see, all we want to do is look at it. And ride it, which is what Baxter does. 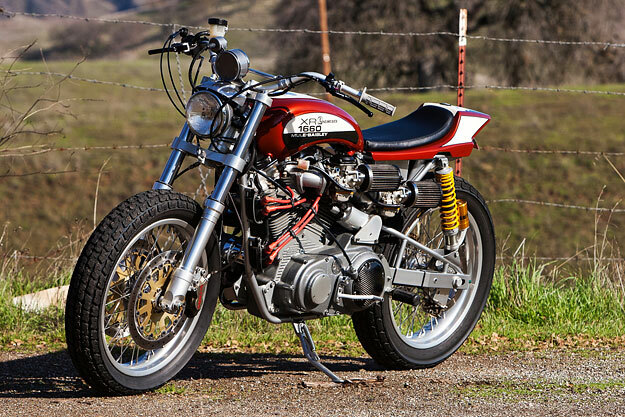 In fact, in the tying together of all the vital components of this build, one key element was a 3.0-gallon fuel tank hand-built by Racetec, which gives Baxter enough range for the spirited rides he enjoys near his Northern California home. The project began nearly 10 years ago and has gone through many, many iterations. Perhaps the brutality of the build is reflected in the barely contained brutality of the riding experience. The Punisher rides like a barium beach ball with a thermonuclear-explosive means of propulsion. It doesn’t feel heavy, exactly, but it does feel incredibly dense. And, yes, explosive. 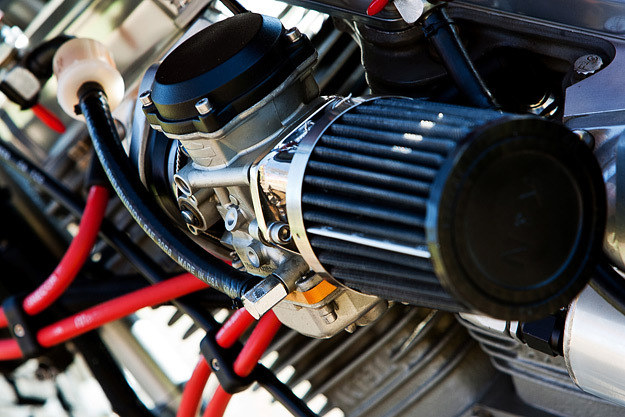 Note the 100-cubic-inch, 130-horsepower/130-foot-pound Sportster-based heart, and also note the miles of aerospace-grade plumbing to help the engine’s internal breathing capacity and oil flow. It seethes when it breathes. Pollock’s take on the engine built by famed tuner Dan Baisley and further developed by Baxter and Dale Lineaweaver of Lineaweaver Racing? “I was sworn to secrecy concerning funds expended if his wife were to ever call.” Ha! 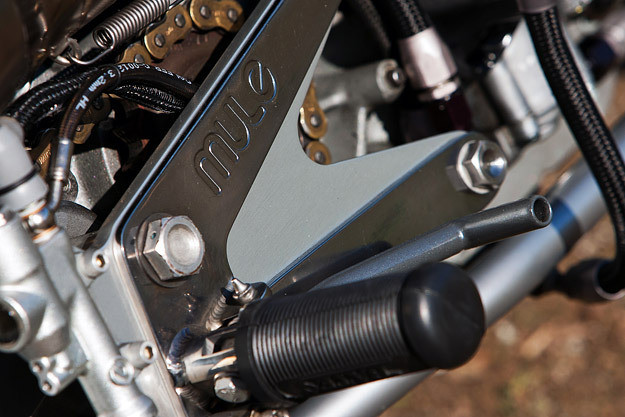 The development process saw the bike get completely stripped at least three times, including complete engine disassembly each time, with Baxter, vice president of operations for a communications startup, primarily doing the work. Sun rims carry—what else?—19-inch Goodyear dirt-track tires. 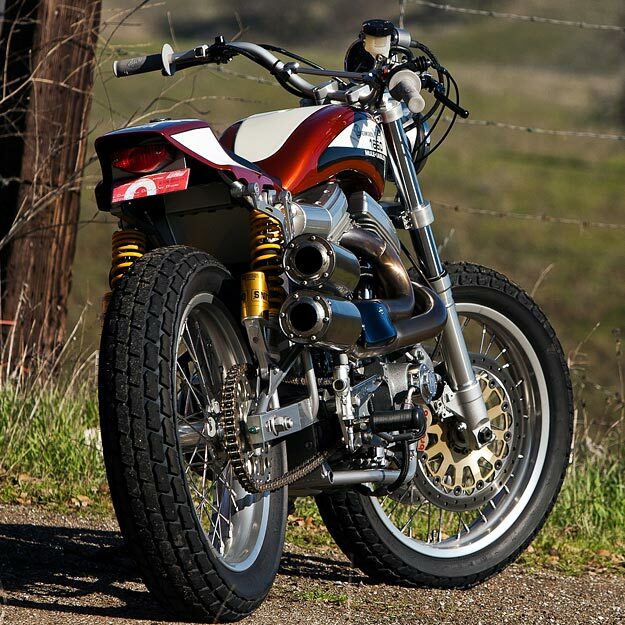 The front hub is Yamaha XS650 and the rear is from A&A Racing, in XR-750 style. Seems to me that this is a motorcycle that shows just the kind of strength and dedication a Punisher fan would love. Images by Andrew Wheeler of AutoMotoPhoto.